MK Amir Peretz, once head of Labor Party, splinters from Labor list and joins Tzipi Livni's "the Movement." MK Amir Peretz announced in a joint news conference Thursday morning with former Kadima head Tzipi Livni that he is leaving the Labor list and joining Livni's list, "The Movement." He said that he will be in the Number Three spot in Livni's list. Amram Mitzna, former CoS and mayor of Haifa is in the second spot. 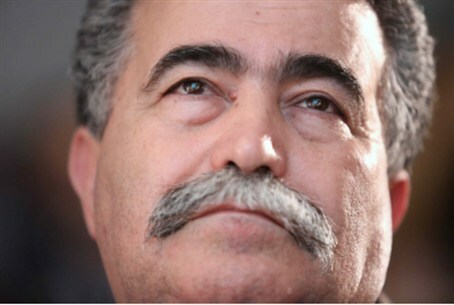 Peretz said that he would be resigning from the Knesset later in the day Thursday. The Labor party reacted to the news by saying it was "a relief" to be rid of Peretz, who had been busy "sabotaging" the party from within. Peretz, who until Thursday morning occupied the Number Three spot in the Labor party's list for the Knesset, mounted an attack on party leader Shelly Yechimovich on Channel 2's Meet the Press Saturday. He demanded that Yechimovich state clearly that she will never sit in the Netanyahu government, and insisted that she spell out a detailed plan for peace with the Palestinian Authority. The presenter, political reporter Rina Matzliah, asked him if it was true that he was considering splitting off from Labor after the election along with six other MKs. He did not confirm or deny this, but said that at this point he is trying to convince Yechimovich to take the steps he wants taken. Peretz headed the Labor party when Yechimovich joined it, seven years ago. He welcomed her heartily but they have since become rivals as she garnered the leadership.